Vuyo Aaron Ngqondwana was one of the hundreds of psychiatric patients moved out of Life Esidimeni in callous cost-cutting measures by the Gauteng Department of Health. He was moved to the Cullinan Care and Rehabilitation Centre, where he died months later. An autopsy found a large plastic sheet in Vuyo’s stomach. He died of aspirational pneumonia. South Africa has looked on in disbelief as the events resulting in the death of Vuyo, and more than 140 other psychiatric patients in NGOs around Gauteng have been laid bare before the Life Esidimeni arbitration, headed by former Chief Justice Dikgang Moseneke. The Gauteng Department of Health’s austerity measures put the lives of hundreds of some of the most vulnerable patients in the system at risk, and the result could not have been more harrowing. Vuyo’s father, Christian Ngqondwana, recounting when he heard of his son’s death, said “I was very cold, I shivered, I cried like a baby.” While Christian and other family members delivered gruelling accounts at the arbitration process, Minister of Finance Malusi Gigaba delivered his maiden Mid-Term Budget Policy Strategy (MTBPS). With a national revenue shortfall in excess of R50 billion and growing, the immediate future of public expenditure on policy commitments and a more equitable realisation of socio-economic realisation has been called into question. This is exacerbated by the fact that an increasing chunk of government expenditure will go towards servicing debt and assisting financially crippled state-owned enterprises. Departments of Health are also not immune to the kleptocratic affliction spreading through state structures. Four of the ten most reckless government departments, together contributing 53% of total irregular government expenditure over the last year, were provincial departments of health. Of the R3, 5 billion rand irregularly spent by the Free State Department of Health during the last year, some was related to money not spent in terms of the conditional grants it received from national treasury. The KwaZulu-Natal and Mpumalanga Departments of Health respectively spent R3 billion and R1, 6 billion irregularly. The Gauteng Department of Health spent R2 billion irregularly, half a billion of which was related to the procurement of construction contracts, security services as well as various other contracts. The department spent a further half a billion rand on an unnecessary data-storage facility, and failed outright to explain R46 million of its expenditure to the auditor general. There is perhaps no better time to step back and take stock of the public health-care system, and to start to answer the broader question: what shape is our health-care system really in? Let’s start at an obvious and important place – who is taking care of South Africans, and where are they? The Department of Health initially kept expenditure high to offset the inevitable effects of the 2008 global financial crisis. However it has been in full blown austerity mode since the 2012/13 financial year, when both the number of filled posts in the health sector and the amount of money used to pay the people in those posts began to drop dramatically. These austerity measures have had a marked impact on the number of health workers in the public health sector. While the number of filled posts in provincial Departments of Health increased by 80 679 between 2006 and 2012, they fell by 5 473 between 2012 and 2016. 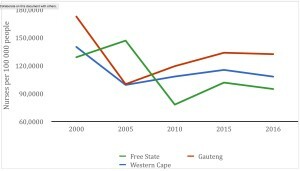 In the figure below, from a recent review of the right of access to health care services by the Studies in Poverty and Inequality Institute, it is clearly visible that the number of nurses – the backbone of any functioning public health system – have decreased in Free State, Gauteng and Western Cape. Rural provinces are, however, disproportionately burdened by cost cutting measures. Dramatic provincial inequalities, usually along urban/rural lines, have developed in the distribution of almost every type of health care worker. The graph below, for instance, shows that in 2016, there were only 1.3 specialists for every 100 000 people living in Limpopo. At the same time, the Western Cape had 26 more specialists per 100 000 people. These and other alarming trends in the number and distribution of health-care workers in South Africa as a whole stand to reason: budgets intended specifically for the training and development of health professionals have seen drastic cuts. The next obvious question is what we need these health care workers for? 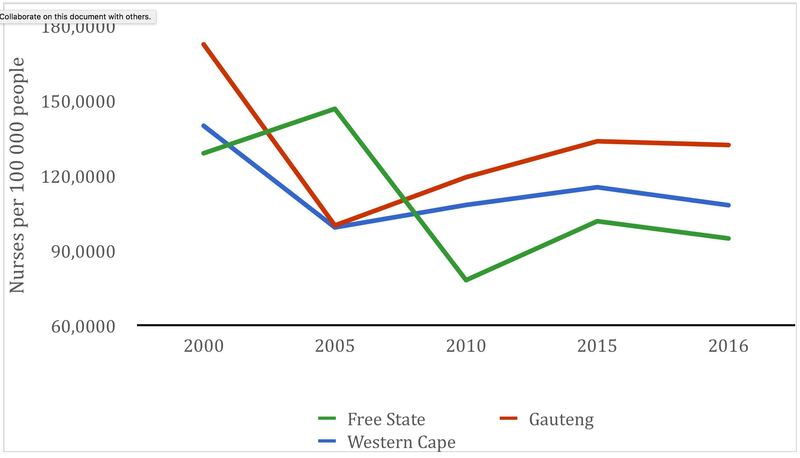 South Africa’s epidemiological mortality profile has changed over the last decade, in part due to government’s successes in coming to grips with the HIV / AIDS pandemic. Non-communicable diseases like diabetes and hypertension have surpassed communicable diseases as the main cause of death of South Africans. Some figures attributed 56% of deaths in 2015 to non-communicable diseases, compared to 33% as a result of communicable diseases and 11% as a result of injuries. Government has made notable gains in tackling TB-HIV co-infections. The deadly duo remain a serious challenge in South Africa, however. While new infection rates have fallen, Tuberculosis continues to be the number one single cause of death. The 8 metros in South Africa account for about 40% of TB infections. eThekwini has the highest number of TB cases in South Africa, yet it also has one of the lowest treatment success rates. It also has the highest proportion of TB patients who have not been evaluated (18.5%) and is also among the five districts with the lowest proportion of HIV-positive TB patients on anti-retroviral treatment (70%). Serious challenges regarding HIV are also unresolved. The graph below, shows the proportion of HIV-exposed new-borns who received an HIV test within six days after being born. Early testing is a crucial health care intervention to encourage early initiation on anti-retroviral treatment. However less than one in every two new-borns exposed to HIV in the Eastern Cape received a test. At the district level, the picture is even worse. In Lejweleputswa district in the Free State, for instance, only 32% of new-borns were tested, while Alfred Nzo and OR Tambo districts in the Eastern Cape had coverage rates of 33.8% and 24.5% respectively. Given the dramatic consequences of failure to test and treat new-borns exposes to HIV within their first six days, these figures, particularly in the Eastern Cape are alarming, especially when considering that the testing of HIV-exposed new-borns is now a departmental priority. The long awaited National Health Insurance (NHI) policy, which was released earlier this year, has the potential to radically transform the health-care system. It would shake the foundations of the two-tier system we inherited from apartheid where an overwhelmingly white minority receive quality private services while the overwhelming black majority are left to rely on a public system gasping for adequate funds. NHI would ensure that quality health care is available to all regardless of socio-economic status or geographical location. Current budgeting for the implementation of NHI remains scant, however. And as with most things, the success of the NHI depends on an efficient public health system. Without health-care workers, a health system cannot function. If the intention to roll out current NHI pilots into national policy is to be taken seriously, the project will require not only greater allocation of funds, but robust capacity building in the public health sector in order to support the programme. The Constitution places an onus on the state to progressively realise people’s socio-economic rights, meaning that over time access to health-care cannot narrow and must consistently broaden. And there have been notable successes in the government’s efforts at ensuring everyone in South Africa progressively enjoys the right to health care services since the transition to democracy, especially with regard to addressing the HIV/AIDS pandemic. However very real challenges remain. Indeed, there are numerous instances in which aspects of people’s right to health care services have regressed, and in some cases quite dramatically. When one considers that more than four in every five people in South Africa fall beyond the purview of the private health-care system, it becomes clear that the burden of addressing these shortcomings will fall squarely on the shoulders of the state. Like so many other post-apartheid atrocities, the callous deaths of psychiatric patients as a result of attempts to balance the books, highlighted during the Life Esidimeni arbitration, will likely vanish into memory. We should not make the mistake of thinking that the human costs of austerity are limited to Life Esidimeni though. Our public health care system is under a cost-cutting siege on the one hand, which will only deepen with mounting investor pressure on treasury to balance the books. On the other, rampant irregular expenditure is bleeding provincial departments of health dry. Our challenge is to demand a system of government allocation and expenditure which prioritises people and not elite class interests. Public funds should be keeping nurses in hospitals and clinics stocked, and not used to pursue nuclear energy or mop up the spills of inefficient state owned enterprises.